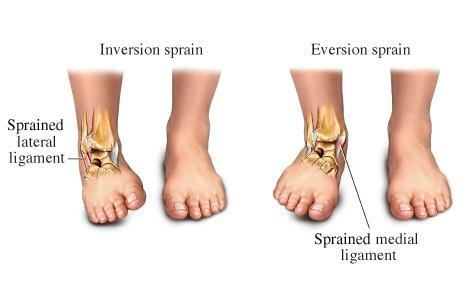 The most common type of ankle injury is a sprain, which is stretching and tearing of ligaments. There are many ligaments around the ankle and these can become damaged when the ankle is forced into a position not normally encountered. Most frequently, ankle sprains occur when the ankle “rolls in.” This is encountered when one walks on an uneven surface and in many sports where sudden stops and turns are common, such as basketball, volleyball, and tennis. Many patients report hearing a “pop” when the injury occurs, followed shortly after with pain, swelling, and bruising. Initial management usually involves the “RICE” principle. This stands for Rest, Ice, Compression, and Elevation. The main error people tend to make is to put heat on the ankle. This will increase the swelling and pain. It is also important that you visit with Houston podiatrist Dr. Andrew Schneider. The severity of the sprain needs to be determined and, most importantly, it is important to be assured that there is no fracture. Ligaments heal quickly, but not in a good, stable position if they are not treated appropriately. Wearing an ankle brace is not enough...there are even advanced therapies, such as shockwave therapy, to effectively treat ankle sprains. Do not delay your visit to Tanglewood Foot Specialists to assure the best possible results!